Maggie and Cara have created one of the most beautiful books I have ever seen. When Maggie's pen touches paper, inspiration blooms and grows in your own heart. You feel a sense of kinship when you read her books. It is as if you were destined to read them from the beginning of time. Perhaps the author gained her inspiration from her surroundings in East Blue Hill Maine. She is living my dream! She writes in her cabin in the woods, which is surrounded by wild flowers. Before you even begin reading Maggie's words you will be captivated by Cara Raymaker's joyful and detailed expression of the words. I truly hope to see more of her art in children's and inspirational books. 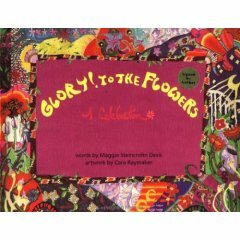 I love Maggie's sing-song poetry and her writing in this book reminds me of the way a child sees the world. "One day when I was young and walking with a friend, a field dry as straw bloomed with flowers." To me, this represented how we can walk through life and create happiness where there was none, or make life better and make someone smile. Perhaps I see this in her writing because she has devoted her life to caring for others and has brought a smile to my face with her writing. She knows that when we reach out to others we receive happiness in return. No one can tell you how to get to the path where you will see the flowers growing, you just have to look inside your own heart, and then you will know how to make the flowers bloom. "The real primary diseases of man are such defects as pride, cruelty, hate, self-love, ignorance, instability and greed; and each of these, if considered, will be found to be adverse to Unity. Such defects as these are the real diseases (using the word in the modern sense), and it is a continuation and persistence in such defects after we have reached that stage of development when we know them to be wrong, which precipitates in the body the injurious results which we know as illness.......But yet there is no cause for depression. The prevention and cure of disease can be found by discovering the wrong within ourselves and eradicating this fault by the earnest development of the virtue which will destroy it; not by fighting the wrong, but by bringing in such a flood of its opposing virtue that it will be swept from our natures." I was very pleased when I learned that the essential oil of roses can remove anger. It is also interesting that men will sometimes give women flowers when woman are angry at them. Could this have some deeper message? I could completely relate to this book as I take Echinacea and believe we can heal our bodies with plants and also prevent disease. When I read the first few words of this book, I remembered a day my nieces and I once went to a favorite park. On the first visit we had walked in the dry grass. On the second visit, Ashley ran into the park and exclaimed with delight: "It happened, it happened, my wish came true." "What wish," I asked. "I wished that the next time I came to this park it would be filled with flowers." Ashley got her wish and now I will give her this book. She knows the flowers can bring happiness with their faces turned to the sun and their petals fluttering in the breeze. Patricia Clark takes great pleasure in describing memories of life in Seattle and Tacoma. She is also inspired by rivers and Lake Superior as she describes grief, wonder, joy and yearning. The first few poems are almost an introduction to her style, but I wasn't fully captured until I read Inflorescence: Fennel. In this poem she describes cooking with fennel and I had just mixed up a spice mixture with fennel seeds. While she is cooking with the fennel root, I still had a sense of the licorice flavor permeating the flavor of the fish. She describes the aroma as a prayer rising through the rainbow trout's flesh. I though the prayer image was beautiful and gave the poem a sense of reverence. Anyone who loves to cook will relate to the images in this poem. Hiking Near Paradise was a real delight and will be for anyone who found a field mouse as a child. The Sound of a Mother Scolding Her Grown Daughter presents a scene from Orcas Island. The island is mysterious and Patricia Clark truly captures a contrasting moment in a very peaceful location. Here she feels vulnerable, longing for her mother's appreciation and understanding. She finds herself "ghostly," pretending to read a map while crying. "I'm hunched over, trying to stop my hands / from shaking, doing what I can to wash the taste / of her words from my mouth." "Missing" was the moment where I found myself crying. I read this poem three times in a row because the feelings are quite conflicted and Patricia Clark captures a moment of time where you can no longer move forward because the past is too strong and will not yet release you. As the river moves forward, Patricia is left wondering how she can even go to the riverbank, where such a tragedy has occurred. The images are of a river moving forward and a woman caught in the whirlpool of her own emotions, in total conflict. One of my favorite poems is the mysterious: Spirit Bundle. Here we find the poet at Lake Superior, crafting a container made from birch-bark curls and rugosa rose petals. She seems to be taking all her feelings and sending them off into the watery depths. Each object she uses to craft the small vessel seems to symbolize a part of her she is releasing into the unknown. To me, "Grove" symbolize all the longings a woman can have to be one with nature or to return to the imaginative world of her childhood. Throughout the poems there is a theme of life well lived amongst the inevitable and momentary conclusions of existence. In the few poems where Patricia Clark feels deep tragedy, we feel deeply too. When she soars in the beauty of nature, we cannot help but follow her into her bliss. If you have lived in the Pacific Northwest, then you will feel the chill of a dank rainy day, take pleasure in the peaceful images of lakes and understand all to well, the danger of rivers. I would like to say that this book inspired me to write a poem. As I turned the pages, I felt a poem emerging. It was rather magical, to feel so inspired. 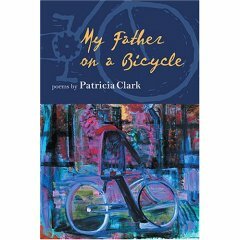 It was as if Patricia Clark's depth of emotion awoke my own sense of longing.